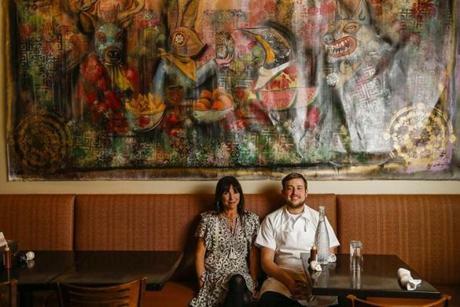 In a difficult year with big-name closures in the Boston-area dining and drinking scene, plenty of inventive work went on in other local kitchens. Global flavors, hearty comfort food, and healthful creations (sometimes made by robots) pleased even the most sophisticated palates. Adding to the satisfaction were creative cocktails, painstakingly selected wines, and flavor-forward beers and spirits. Here are some of the most notable debuts since December 2017. The bar at Alcove before the dinner rush. A greasy slice has its charm, but partaking of a civilized meal before a game or after work is nice, too. Thanks to industry veteran Tom Schlesinger-Guidelli, doing just that is easier than ever at Alcove, near the TD Garden. Chef Maxime Fanton is French and grew up in Italy, Schlesinger-Guidelli has roots in the agricultural area that stretches along Buzzards Bay, and the menu lands somewhere between New England and the Mediterranean: octopus with potatoes, olives, and chiles, say, or radiatori with braised duck. The crack bar staff will take good care of you. With its basket-weave floor tiles, zinc bar, and cafe curtains, this South End spot recreates a traditional Lyonnaise bouchon, or bistro, beautifully stylish and faithful to France’s culinary capital. The food, too, is authentic — quenelles, duck confit, a very soft-cooked omelet with triple-creme cheese, and escargots in pastry, all accompanied by a fine French wine list. This retail and food bazaar in Union Square offers the ideal way to experiment with many cuisines. Up-and-coming restaurateurs in micro-stalls sell homespun dishes, from empanadas to pierogis, fish tacos to roast beef sandwiches, and will offer a complimentary taste while telling their stories. 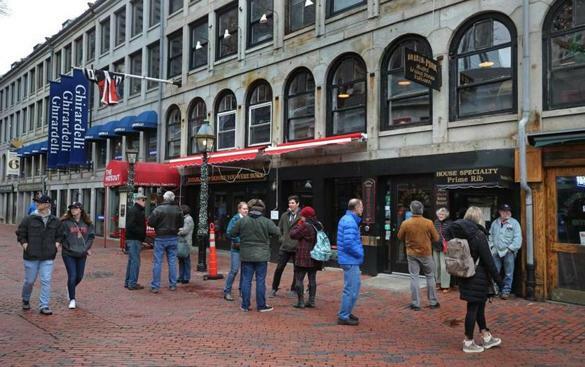 This might be a new way of eating for Boston, yet it’s refreshingly old-fashioned. Remnant Brewery and Rebel Rebel Wine Bar offer a pleasant refuge for more leisurely, but no less intimate, dining. The Landwer Famous Breakfast at Cafe Landwer. 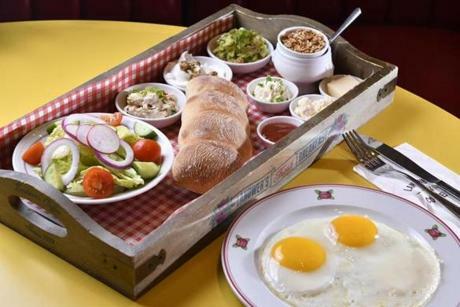 Think of these Israeli-based cafes and coffee roasters as upgraded diners. They serve healthy Mediterranean twists on breakfast, like halloumi shakshouka and herb omelets, plus sweets to balance things out (Belgian waffles topped with gelato and Nutella are a specialty). Dinner features vegan shawarma and vegetable pastas, plus a big kids’ menu with pizza, pasta, and tenders, all served in a cheerful space for a fair price (most entrees are around $15). The cafes are welcome additions to neighborhoods better known for bars and sub shops than vegan breakfasts. 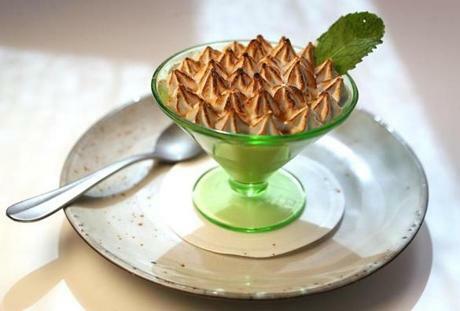 The suspiro limeno at Celeste in Somerville’s Union Square. Restaurant, art project, intimate dinner party: Celeste feels like all three. It’s a tiny space run by a filmmaker and an architect who got their start running a pop-up out of their home. Chef JuanMa Calderón prepares dishes learned from his mother in his native Peru — arroz con pollo (chicken and rice), lomo saltado (stir-fried beef) — with a sure hand and plenty of heart. Don’t miss the ceviche, the causas (cold terrines of mashed potato layered with fillings), or the complex, soulful stews. 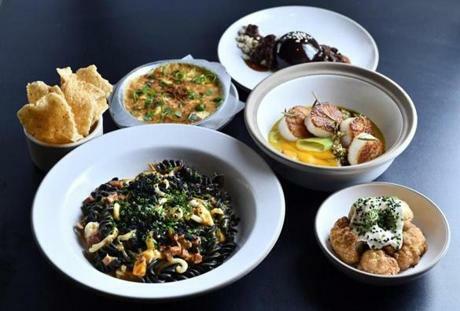 Clockwise from bottom left: squid ink fusilli, crab gratin with puffed rice crackers, chocolate semifreddo, scallops, and fried cauliflower at Chickadee. Pedigree and polish perch on the edge of the Seaport at this restaurant run by No. 9 Park vets. At dinner, chef John daSilva’s small plates glorify vegetables, house-made pasta, and a ridiculously tasty porchetta; lunch means pillowy pita filled with all manner of good stuff. Dishes are infused with the flavors of the Middle East and North Africa; cocktails are named after birds. It looks too cool to be fine dining, but don’t be fooled: It is. So many restaurants have cycled through this space, it seemed cursed. Then DakZen arrived, with its bright-yellow walls, cheerful staff, and boldly flavored, reasonably priced Thai specialties. 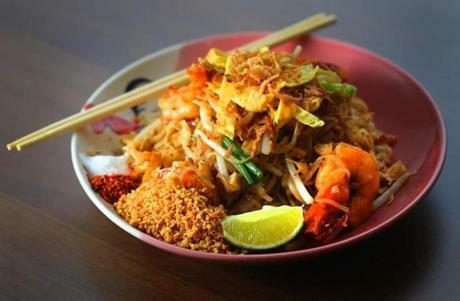 There’s no gummy, sweet pad thai here; the expats running the place feel we all deserve to eat boat noodles and curry-inflected khao soi that taste like the versions they grew up with. We couldn’t agree more. 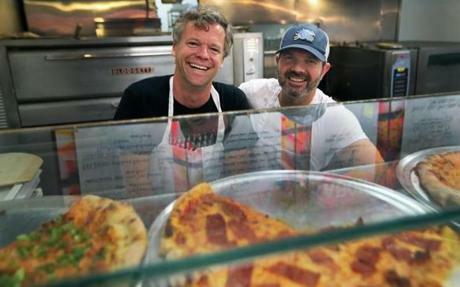 Charlie Redd (left) and Keenan Langlois serve up pizza and kabobs in Somerville’s Davis Square. Pizza is a matter of deeply personal preference, but many believe they’ve found pie nirvana in this Davis Square storefront run by Charlie Redd (Redd’s in Rozzie). No frills — just grab a seat and wait for a slice of soot-stained pie hemorrhaging orange oil onto a paper plate. Toppings surprise and intrigue: bratwurst and potato; prosciutto and balsamic; maple bacon cheddar with chili maple syrup. There’s plain old pepperoni, too — it’s artisanal and comes from Vermont. 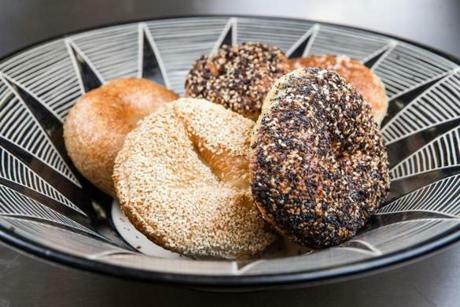 Sesame, plain, everything, and salt bagels at Exodus. 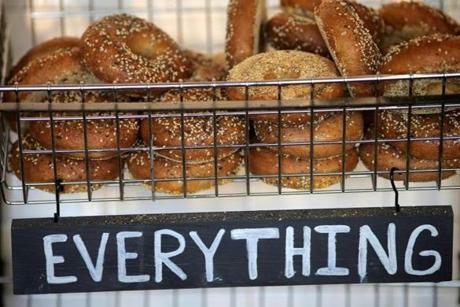 The pop-up stops wandering and settles into the old Canto 6 space in Jamaica Plain, selling the bagels that first won fans at farmers’ markets and other venues. To find out what makes them so good, you can get into the geeky stuff: quick sour starter, hand rolled, cold fermented, boiled with malt syrup. Or you can just taste. The bagels come plain and in flavors such as salt, sesame, poppy, and everything; Exodus turns them into sandwiches such as the G&G Classic (lox, tomato, capers, red onion, and cream cheese), the All Hartt (roasted beets with white-bean spread and greens), and the Roast Beast (house-made roast beef with remoulade, Swiss, and greens). RELATED: What bagel in Boston is for you? Chef Tiffani Faison at Fool’s Errand. An everlasting cocktail party from chef Tiffani Faison, it’s standing only at this nook in the Fenway. Featured are intriguing cocktails, a nice list of amari, and plenty of chef de cuisine Ellie Roycroft’s snacks for grown-ups. Think potato mille-feuilles with lobster gravy, pepperoni croquettes, and Mexican shrimp cocktail, along with destination-worthy bread and butter. Squeeze in at the bar and get your party started. 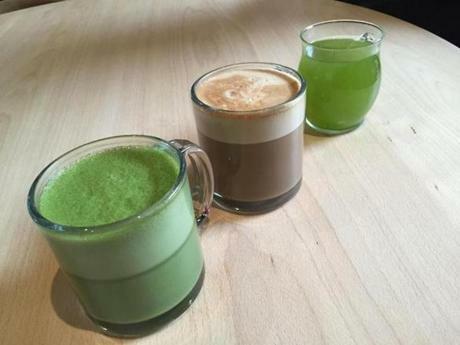 Matcha tea latte, miso latte, and umami green tea. Serenity now, and here, at Japanese teahouse Gen Sou En. The airy, open room in Coolidge Corner is one of the most peaceful spaces around, with a skylight and a small garden of moss and rocks. Come early for counter-service breakfast, baked goods, and tea. At lunch and dinner, Gen Sou En morphs into a full-service restaurant and bar with a menu of tea-inspired dishes, from branzino with green tea quinoa salad to beef tenderloin and vegetables with hojicha compound butter. For dessert, black sesame cheesecake with matcha cookie crust lets you drink your tea and eat it, too. 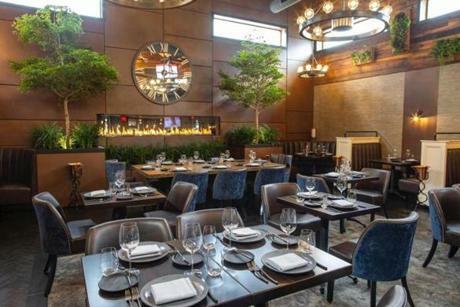 Hoist chopsticks with your fellow masters of the universe at this multi-floor Financial District oasis, a reminder that expense-account dining isn’t dead. You’ll savor pricey, precious twinkles of sushi and bento boxes framed by magical views of the Custom House and other romantic downtown rooftops that soften any awkward business lunch. (The best views are from the upper-level Kumo lounge). 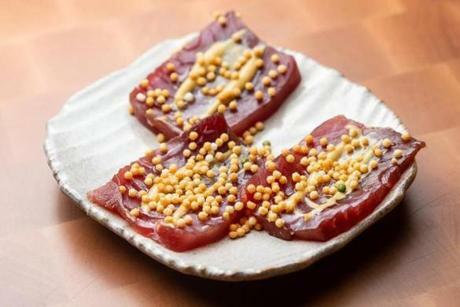 Youji Iwakura, a Berklee College of Music student turned chef, sharpened his skills at Basho and Uni before starting this tranquil bastion, complete with a top-floor roof deck and an admirable selection of sake and Japanese wine. Cook Keara Garcia passes a dish to a server. 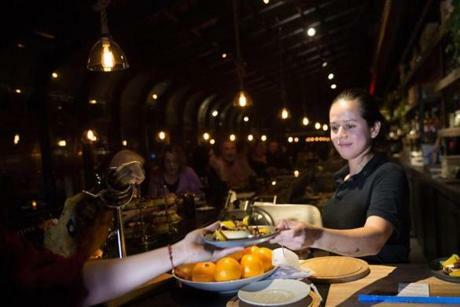 The happiest new restaurant around is tucked along a lonesome Watertown side street in a rail car that looks straight out of an Edward Hopper painting. Husband-and-wife team Gabriel Bremer and Analia Verlo (Salts) warmly welcome guests to a feast of small plates that skip from Uruguay to Spain: a rainbow of baby carrots drizzled with romesco, warm skillets of grilled provolone, silken potato-and-leek soup deepened by rich Mangalitsa ham. To drink? Chat with the amiable bartenders about Spanish wines and fig-infused bourbons, and linger as long as you like. Daters, families, solo wanderers — everyone is family at this earthy hideaway. 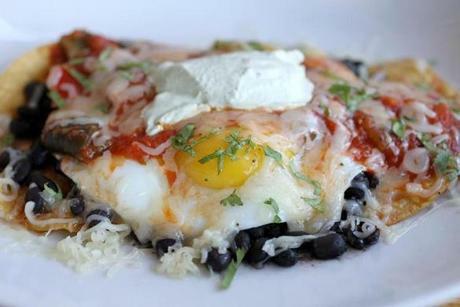 Huevos rancheros at The Little Dipper. This space-themed restaurant — at the Jamaica Plain site that was once home to Centre Street Café — serves breakfast, lunch, brunch, and dinner. Start your day with the Ground Control or the Major Tom, egg sandwiches topped with veggies or meat, or the Saturn’s Double Stack of buttermilk pancakes. Segue into the Scully burger (there’s a Mulder version, too), the Skywalker (fish and chips), and more. Space-travel posters hang on the wall. The theme isn’t random: Co-owner David Doyle is a rocket enthusiast, and he built and launched all of the models hanging from the ceiling. A dish at Mae Asian Eatery. 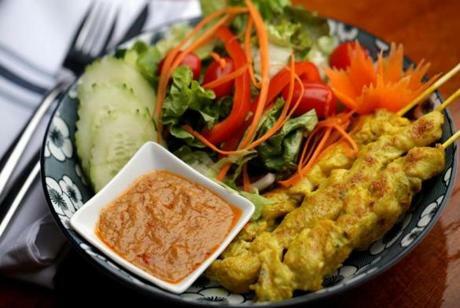 Get a taste of Thai home cooking at this warm and cozy Central Square spot. Thailand-born chef Yuri Asawasittikit based the menu on her mother’s food — mae is “mother” in Thai — with a little Chinese influence in honor of her Chinese dad, plus some Vietnamese and Indonesian specialties. Every meal starts with a basket of crisp, ultra-thin banana chips, presented when you sit down. There are only 20 seats, and alcohol isn’t served, but the atmosphere is homey and welcoming — just like mom’s. The “Mortadella Head” sandwich with potato chips and giadiniera. This is the restaurant of every college student’s hangover fantasies: hubcap-sized wedges of square, squishy pizza topped with things only a young metabolism could absorb, plus vast bowls of pasta, deep-fried everything, French fries soaked in Bolognese sauce, and an appetizer called “Meat Sweats.” This counter-service hangout from the Boston Burger Company team isn’t fine dining, but when you crave a spongy slice quaking with Thousand Island dressing and pickles, well, it’s heaven. Truffle Sho Yu at Oisa Ramen. #17 Hand-Cut Pastrami sandwich at Our Fathers in Allston. A Jewish deli? That isn’t tiny and crowded? And with reservations and parking? No, this isn’t a Curb Your Enthusiasm plot line. It’s a real live restaurant in Allston. The team behind Franklin Cafe and Tasty Burger created a spacious place that is not your grandpa’s Jewish delicatessen — no lines, a gin cocktail named after Good Will Hunting — but that serves the young neighborhood perfectly, with dressed-up versions of classics. 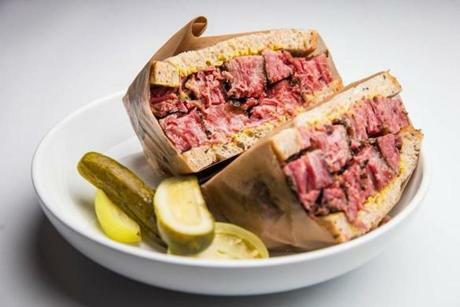 Come for the towering corned beef sandwiches and family-style pastrami; stay for the sweet service and comfy booths that encourage lingering. 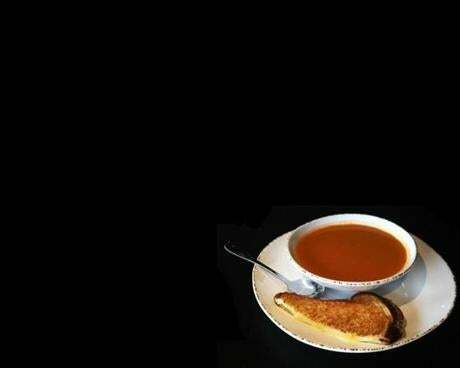 The Tomato Bisque, with a hint of bacon, and baby grilled cheese at Revival Cafe + Kitchen. These coffee shops have many charms. They provide coffee and pastries to an otherwise sleepy corner of Cambridge while also bringing walk-up, window-service coffee to Davis Square. They showcase the talents of Steve “Nookie” Postal, lovable chef at Kendall Square’s Commonwealth. And they offer an outlet for co-owner Liza Shirazi, who recently shuttered her beloved Crema Café in ever-gentrifying Harvard Square. Revival proves that as long as there’s a market for caffeine, there’s room for indie cafes. 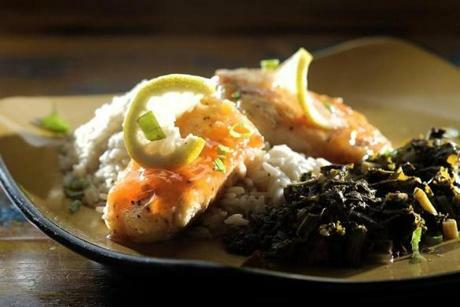 Apricot-ginger glazed fish, kale with beef sausage, and pilaf at Soleil in Dudley Square. Once upon a time there was a restaurant called Keith’s Place (now closed) in Grove Hall, known for its soul food and Sunday brunch. Former operator Cheryl Straughter renewed its welcoming spirit in a new location in Dudley Square. Soleil serves hearty egg combos, sweet potato pancakes, salmon cakes with remoulade, and a roster of generous sandwiches. But the real lure is the steam table, stocked with fried and barbecue chicken, vegetable sides, and a huge, irresistible tray of mac and cheese. Load up your plate. 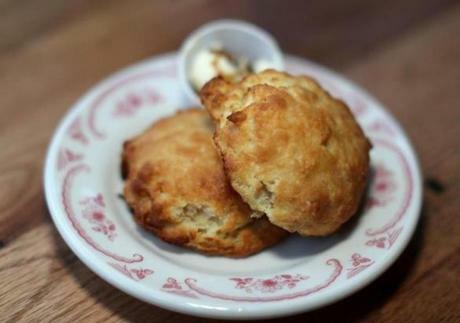 Classic biscuits at Southern Proper. “This is the best pimento cheese I’ve ever had,” declares a Georgia native, swiping a popover through a smear of zingy orange paste. In an improbable farmhouse-style room in the South End, festooned with antique lamps and vibrating with classic rock, chef Jason Cheek (Coppa, Toro) pays homage to his North Carolina childhood. His food makes even hardened Northerners swoon: smoky shrimp and grits, airy little biscuits rich with buttermilk, and greaseless heaps of tangy fried chicken, all enlivened by stiff rye cocktails and a happy staff. 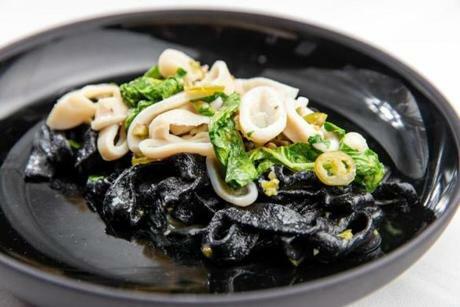 Squid ink fettuccine at Talulla in Cambridge. Much like its predecessor in this space, T.W. Food, Talulla is a little black dress of a Cambridge neighborhood restaurant: elegant, classic, dignified. Chef Conor Dennehy was chef de cuisine at T.W. Food and a cheesemonger at Formaggio Kitchen; wife Danielle Ayer was a captain at Menton. They preside over a narrow, brick-walled room dotted with photos of the couple’s young daughter (the restaurant’s namesake). Tuck into a $60 prix-fixe menu with miso-glazed cod, brown butter agnolotti, and smoked kale enlivened by charred onion — nothing outlandish, everything satisfying — with warm, knowledgeable service to match, often dispensed by the owners themselves. It’s sophisticated enough for your proper auntie or thesis adviser, familiar enough for a last-minute tryst. Adjacent to her sister’s Chinese restaurant Dumpling Daughter, Nicole Liu operates this Danish-inspired Kendall Square cafe, serving healthy-ish, pretty things to eat and drink: avocado toast, breakfast salad, matcha cream rolls, turmeric lattes, Hong Kong milk tea, and the signature camo, which incorporates matcha, espresso, and white chocolate. A new 4 p.m. menu is loaded with appealing snacks such as potato latkes with smoked salmon and assorted crostini, just right with beer and wine. It’s a perfect stop to get some work done or just sit by the window and watch the world go by. Bluefin tuna at Whaling in Oklahoma. 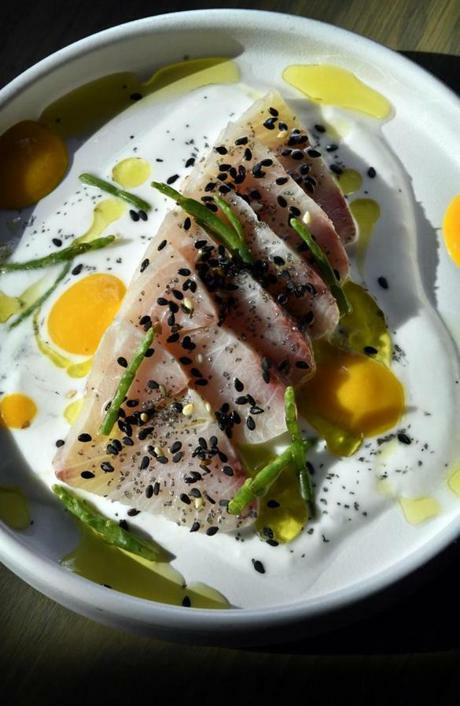 Chef Tim Maslow (Ribelle, Strip-T’s) is back in the kitchen in the South End, this time focusing on the Japanese-inspired cuisine he explored at Ribelle. 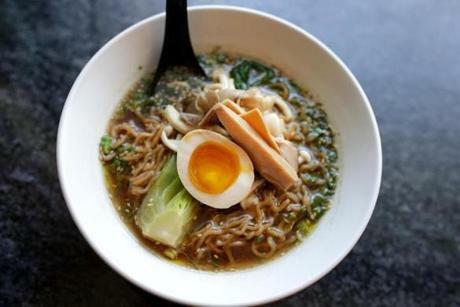 Whaling in Oklahoma showcases pickled and fermented flavors, with a menu that tweaks tradition and touches on yoshoku, Japanese adaptations of Western dishes — curry, Salisbury steak rice bowls, pork cutlet sandwiches. 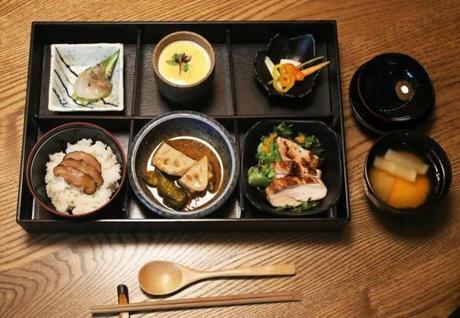 Vegetable dishes are highlights, as are cocktails made with ingredients such as miso and matcha. The fast-casual trend continues to transform the dining landscape with infinitely adaptable dishes that suit everyone from ravenous chowhound to discriminating expert. 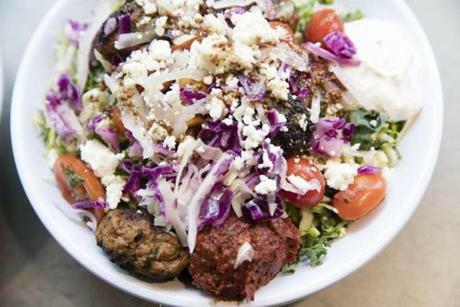 A super greens bowl with spicy lamb meatballs, hummus, tzatziki, harissa, tomato, onion, cabbage slaw, crumbled feta, and greek vinaigrette at Cava on Boylston Street. Bowl-and-salad chains are as ubiquitous as frozen yogurt was in the 1990s. Happily, the Back Bay branch of Cava stands out from the pack with bold Mediterranean flavors and lightning-fast service. Fall into line and point to your favorite ingredients: aromatic saffron rice, jalapeno-infused feta mousse (good enough to eat like ice cream), colorful roasted vegetables, and glistening meats (braised lamb, juicy and rich, is a must). Finish your masterpiece with dressings that are anything but afterthoughts — sriracha Greek yogurt and green harissa will elevate your lunchtime routine from gray to Technicolor. 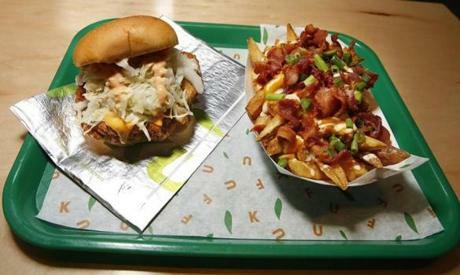 The Loaded Fries and Knockout Sandwich at Fuku. 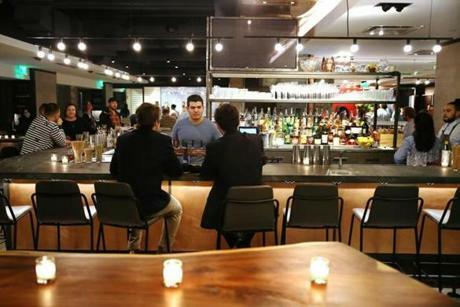 Fuku caused a stir when it arrived in the Seaport, bringing name recognition (it’s a creation of Momofuku super-restaurateur David Chang) and New York City cred. Fried chicken made with dark meat is the specialty, along with cheese fries and slushies. It’s an efficient place to get your junk food fix, with lots of dopamine hits along the to-go line: caloric toppings (ranch, bacon), unusual add-ons (fried squash rings, spicy wet glaze), and speedy service. In a neighborhood with virtuous fast-casual options aplenty, Fuku remains unabashedly naughty. Chef garde manger Marcos Lemus adds the final details to a bowl at Spyce in Boston. Well, it’s the end times. Robots make our food now, but at least that food tastes good. 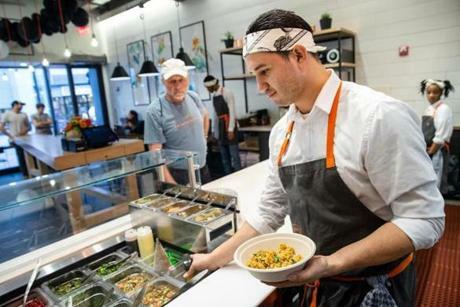 A group of MIT graduates created Spyce, in Downtown Crossing, which features dishes prepped and garnished by humans but otherwise prepared by a robotic kitchen. This results in all kinds of efficiency: meals completed in three minutes or less, a kitchen that runs on nothing more than electricity and water, a reduction of labor that leads to a reduction in price. Happily, human chefs Daniel Boulud and Sam Benson are on the creative end of things. The result: satisfying meals like the Latin bowl, with chicken, black beans, cabbage slaw, corn, radish, and avocado crema over brown rice, and the vegetarian Lebanese bowl, which contains lentils, feta, kale, tahini, and more. RELATED: Robots made me lunch. I enjoyed it. Is that so wrong? 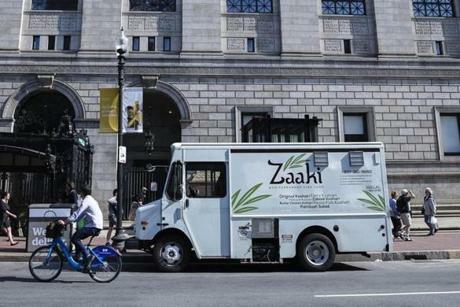 The Zaaki Food Truck in front of the Boston Public Library. Many Egyptians think of koshari (pronounced KO-shar-ee) as their national dish. It’s a study in carbs, beginning with rice and lentils topped with tomato sauce and garnished with crispy onions, chickpeas, and macaroni. In London, restaurants specialize in it. In Boston, it’s the centerpiece of Zaaki (Arabic for “delicious”) Food Truck, owned by Samar Abdalelah, born in Saudi Arabia and a graduate of the Cambridge School of Culinary Arts. The truck sells koshari plain or with toppings, such as chicken shawarma or the Middle Eastern salad fattoush. Even with all those grains in one bowl, Abdalelah manages to keep her version light and flavorful. Her truck is at Harvard Science Center Plaza for lunch Tuesdays and dinner Wednesdays; the schedule will expand come spring. 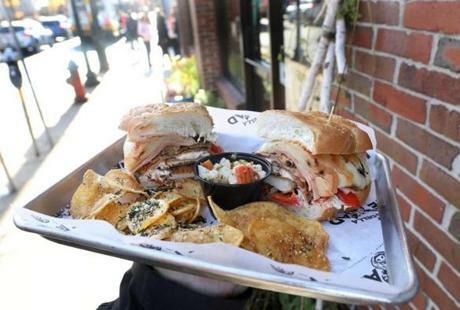 Profit-gobbling rents and cutthroat competition bedevil many restaurants in Boston and the nearby suburbs, but the situation has a silver lining for residents of more distant towns: top-notch dining a stone’s throw away. Owner Kristin Canty and chef Charlie Foster at Adelita in Concord. Tacos and burritos in West Concord? 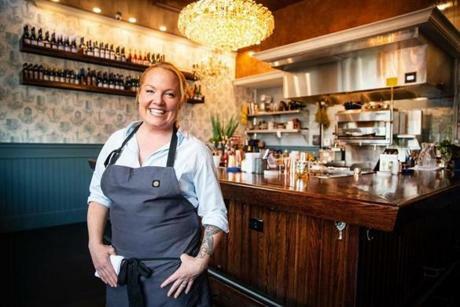 Yes, thanks to ambitious restaurateur Kristin Canty, who injected new life into the quiet neighborhood with Woods Hill Table, spotlighting ingredients sourced from her New Hampshire farm. Now she works the same magic at Adelita, drawing crowds with organic Mexican food, much of it vegetarian and gluten-free. In an area short on dining options, Adelita is a bustling refuge. 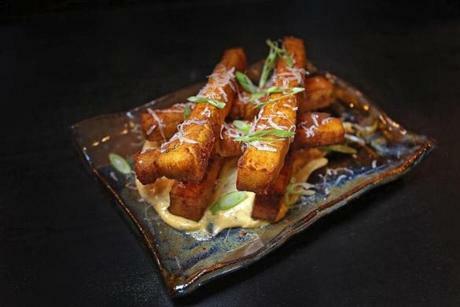 Chickpea fries are among the menu items offered at Balani in Waltham. Dave Becker is inching his way around Route 128, first with Sweet Basil in Needham, then Juniper in Wellesley, and now Balani in Waltham. Unexpected touches dot the menu: duck egg and duck-fat frites on poutine, pepitas and manchego with roasted Brussels sprouts, and paprika mayo with chickpea fries. Decor in the cavernous space includes bucket chairs, floor-to-ceiling curtains, and statues and figurines left by a previous tenant, including a statue from Thailand holding a boom box and take-out menus at the door. It’s a mish-mash, but you have to admire their pluck. Lamb Scotch egg at The James in Needham. Lucky Needham commuters can step off the train and into The James, a gastropub right next to the tracks. 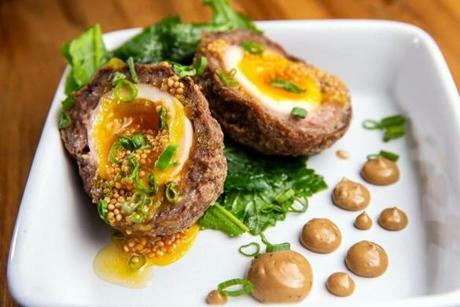 Crowded and convivial, it serves gourmet takes on Irish pub fare and more: soda bread with honey butter, a killer Scotch egg, and a short rib and ale pie beneath puff pastry with horseradish mascarpone. Plus, grilled jerk prawns with sweet potato puree, an oyster roll with white kimchi, grilled octopus with chickpea puree, and house-made fettuccine with squash, mustard greens, and sage brown butter. The bar pours a proper Guinness and has excellent cocktails. Don’t sleep through the stellar brunch. Everyone is here, from babies to grandparents, and Sunday afternoons bring live traditional Irish music from the band NightSide. Hamachi crudo in leche de tigre at the Wellington in Belmont. Belmont’s sleepy town center cried out for a simple American bar and grill, the type of place where parents fresh off soccer practice could hoist martinis and frisky kids could gobble mac and cheese. The solution is the Wellington, a reliable joint from the DeMagistris family, which runs the swankier Il Casale across the street. No surprises here — just an on-point roster of burgers, mussels, and steak frites delivered by servers who know how to read a room. Every town needs a gathering place versatile enough for families with small kids, business dinners, and celebrations, and this restaurant brings all that to Stoneham. The food has an unpretentious appeal: silky puréed soup with Macomber turnip, celeriac, and apple; a salad of shaved Brussels sprouts and kale with Honeycrisp apples and hazelnuts; the “skinny” burger on a potato bun. Chef and co-owner Patrick Campbell (No. 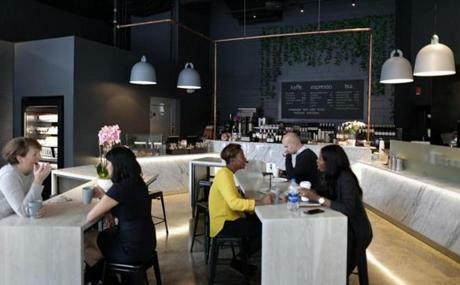 9 Park, Cafe ArtScience) was raised here and wants his place to become its watering hole. Freshly baked bagels at One Mighty Mill in Lynn. Jon Olinto and Tony Rosenfeld, who founded b. good, now run this café in the heart of downtown Lynn, drawing wisecracking neighbors and curious visitors who watch through enormous windows as local wheat is milled into flour and bakers work the ovens. Dense, fiber-rich bagels, pretzels with mustard, and coffee from Atomic, in Beverly — plus fresh-milled tortillas, pancake mix, pizza dough to go, and a 15 percent discount for Lynn residents — make this modern mill feel like a healthy, New Age version of Cheers. Paprika Grill makes falafel to order to maintain the food’s soft interior and crunchy exterior. Even the simple dishes in Turkish cuisine are labor- intensive, and Emrah Arslan doesn’t take any shortcuts at his Salem restaurant, a reborn version of the place he ran in Gloucester. Order kebabs here on a rice bowl, in a wrap, or in a pita pocket and add hummus, pickled red cabbage, and other toppings. 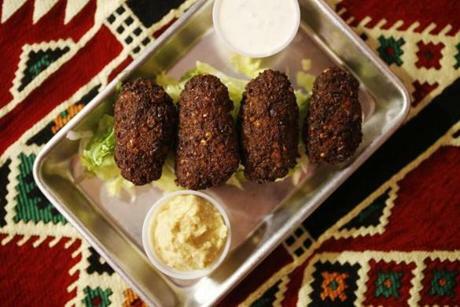 Giant, crunchy falafel are also on the menu, along with many delectable eggplant dishes. The food here is as good as it is in Arslan’s homeland. Since there are only a dozen seats, it’s mostly takeout, but in nice weather an outdoor garden seats an additional 20. 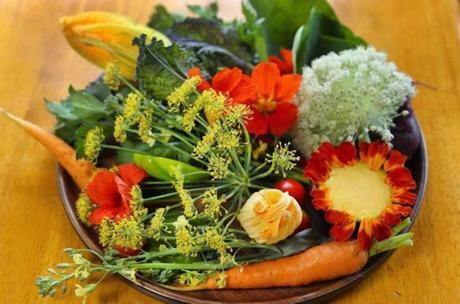 A salad of flowers, herbs, and vegetables at the Buffalo Jump in East Falmouth. You won’t find typical Cape Cod chowder, fried clams, and lobster rolls here. The Buffalo Jump, open from April through December, serves inventive cafe fare by day and tasting menus by night. It features wild, farm-fed inventions pulled from the brain of chef Brandon Baltzley, like “You Can’t Smoke in the Tomato Garden,” a composition of charred tomatoes and fresh raspberries with wheatgrass mayonnaise, Earl Grey tea, and sesame. “Painting It Black” is a dark, rustic bowl filled with even darker ingredients — nori, cherry, tuna, tuna blood. You can get a lobster roll anywhere. Come here for risk-taking and envelope-pushing food on beautiful Coonamessett Farm (tour included with dinner). Chandra Gouldrup won a cultish following with her North Easton brunch-and-more spot, The Farmer’s Daughter. Its after-dark sibling, Towneship, is a glimmering space in a reclaimed church. Filled with warm wood, plants, and a fireplace, it features classy New England bistro fare — duck confit with Brussels sprouts, oyster and fish stew with apple and root vegetables, chicken pie, lamb chops with cassoulet, and much more. It has a sophisticated bar menu as well as a kids’ menu.